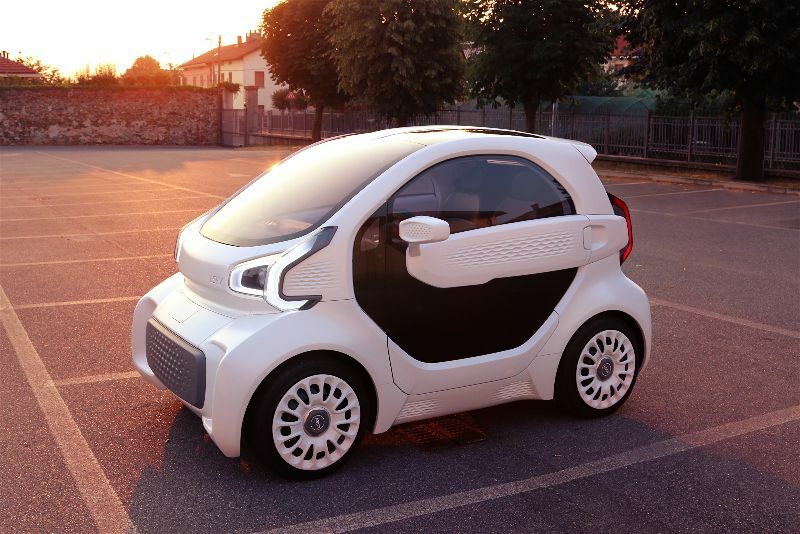 3-D-printed electric car: A sign of future manufacturing? Their LSEV weighs 992.08 pounds, and the car’s components have been cut from what Polymaker called a more traditional 2,000 parts to 57. For comparison, a 2018 smart fortwo electric drive coupe’s curb weight is 2,363 pounds, and a smart fortwo electric cabrio weighs 2,383 pounds. Interesting Engineering reported the vehicle is 8.2 feet long, 4.3 feet wide and 4.9 feet high. The two 2018 smart fortwo electric drive cars discussed above are 8.8 feet long, 5.5 feet wide and 5.1 feet high. The LSEV’s top speed is 43 mph, while its range is 93 miles, the South China Morning Post reported. The smart cars can hit 81 mph but only have 57-58 miles of range. The Morning Post reported the car would be sold for 60,000 Chinese yuan, which works out to $9,392. The smart coupe’s U.S. MSRP is more than twice that, and the cabrio more than triples it. “Production costs can be slashed further as volume increases and by 2024, the total costs for our cars will be cut by half,” Guo told the Morning Post. 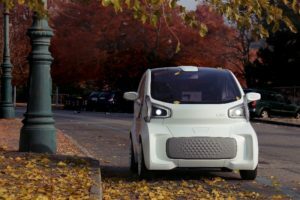 Polymaker wrote in a that additive manufacturing allows a car company to produce the car for a 70 percent cheaper investment than establishing a “traditional production system.” It also knocks the typical research and development time for a vehicle model from 3-5 years to 3-12 months for XEV. The Morning Post reported a single production line can spit out 500 vehicles a year, but XEV senior designer Guo Xiaozheng told the newspaper the lines are “easy to set up and are not expensive,” and a single plant could have multiple in place. Interesting Engineering reported the car could be printed in as few as three days. Though the chassis is built through traditional manufacturing, the top half of the safety cage appears to be constructed from 3-D-printed parts, based on a March Polymaker video. “Safety assessments show that the car is four or five times stronger than its conventional equivalents, such as Smart cars. Structural infill is added into the 3D printed parts,” Interesting Engineering reported. XEV has orders for 5,000 units from Poste Italiane (Italy’s postal service), even though production isn’t expected to start until 2019’s second quarter. At one point, it also had an order for 2,000 from BNP Paribas leasing company ARVAL, but 3D Printing Media Network reported in late March that while ARVAL wasn’t ruling out the possibility of another deal someday, the memorandum of understanding expired in 2017. Over in the world of supercars, Bugatti announced in January it and Lazer Zentrum Nord of Hamburg had created the “world’s largest functional” titanium car part generated from 3-D printing — brake calipers for the Bugatti Chiron — calling it a “milestone” in additive manufacturing. Bugatti planned trials for the part sometime in the first half of the year. 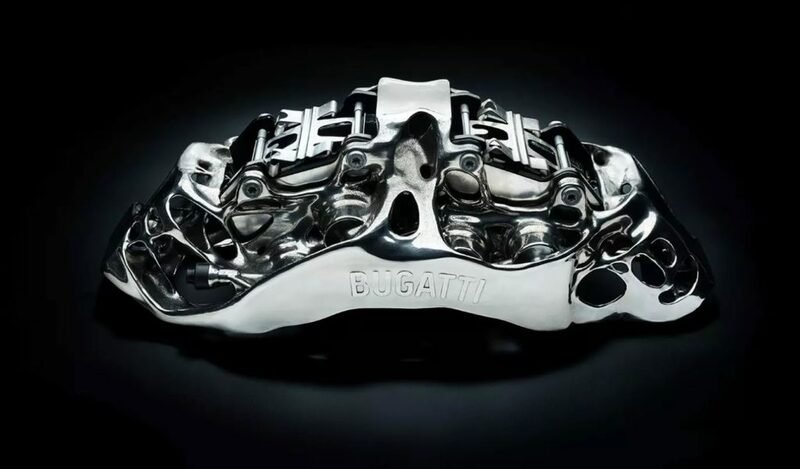 But Bugatti built its test brake calipers out of an aerospace titanium alloy used for engines and “highly stressed undercarriage and wing components.” The stuff is so strong that you can 3-D print with it and still get 1,250-megapascal tensile strength, according to Bugatti. However, the printed titanium caliper only weighs 6.4 pounds, more than 4 pounds lighter than the existing 10.8-pound caliper. Its walls range between 1 and 4 mm thick. Titanium is so strong that an OEM couldn’t easily mill or forge a caliper out of it using traditional manufacturing, according to Bugatti. But with 3-D printing, Bugatti can generate the desired shape out of 2,213 layers of titanium powder, each layer individually melted by four 400-watt lasers into the right shape before moving to the next. “Following the completion of the final layer, the remaining titanium powder which had not melted is removed from the chamber, cleaned and preserved for reuse in a closed loop,” Bugatti wrote — suggesting the kind of efficiency and materials saving which ought to be attractive for manufacturing at scale someday. The calipers are heat-treated at an initial 1,292 degrees Fahrenheit, which drops to 212 degrees during the process; they also receive a chemical, mechanical and physical treatment to boost fatigue strength. Bugatti also sticks the calipers in a five-axis milling machine for 11 hours to produce surfaces like threads and piston contact surfaces. Echoing the boasts about the LSEV, Bugatti noted that the 3-D-printed caliper went from idea to finished product in three months. Sure, most of you readers don’t work on Bugattis. But the OEM says the brake caliper “has underlined its lighthouse function for 3-D printing within the Volkswagen Group and its role as an innovation driver in the international automotive industry.” That means that other Volkswagen Group OEMs might be able to draw from the Bugatti example and start 3-D printing stuff on a car you would see in your shop, such as an Audi, Porsche or Volkswagen. Bugatti also has 3-D printed a 24-inch-long “aluminum windscreen wiper board” which weighs 0.88 pounds — half of a traditional die-cast aluminum board’s weight — but is just as rigid. “But that is another story,” the OEM teases. Finally, a fascinating April story in Parts & People recounts how Cutting Edge Collision owner Tom Halvorson laser-scanned and 3-D printed a grille for a customer’s 2011 Saab 9-4x when a replacement part for the low-run vehicle — sold during Saab’s death throes — proved virtually impossible to find. (Even the tooling has been destroyed, Halvorson told the magazine). The part cost about $3,700 and took a few weeks of work, Parts & People reported. The shop kept the CAD file so other repairers can print new grilles for $1,800-$2,000, according to the magazine. Definitely check out the full article here. In many instances, we could see 3-D printing a part opening up a tangle of patent, liability and fraud issues. (Though, we’d bet an OEM-sanctioned means of doing so ultimately does reach the aftermarket sometime in the future.) But in a situation like this, where the customer and carrier are fully informed, the replicated nonstructural component matches the original material as closely as possible — “I did ABS/nylon on the grille, because the original was ABS and injection-molded,” Halvorson told the magazine — and the part truly doesn’t exist anymore, Cutting Edge appears to have hit on a brilliant solution.